Facebook’s mobile payment ambitions have been known for quite a while and today, we’re finally getting to see what the company has been working on over the past couple of years. The new mobile payments feature is built into the Facebook Messenger app. When sending a message to a friend, you’ll soon find a dollar sign icon. Simply tap the icon, enter the amount you wish to send and tap pay. Funds are transferred immediately, free of charge although it may take a few days to show up in the recipient’s bank account which is the typical waiting period. There are a few limitations you need to be aware of. For now, Facebook is only accepting MasterCard and Visa debit cards from US banks which will need to be added the first time you send or receive money. Once added, you can create a PIN number for increased security (or use Touch ID on compatible iOS devices). 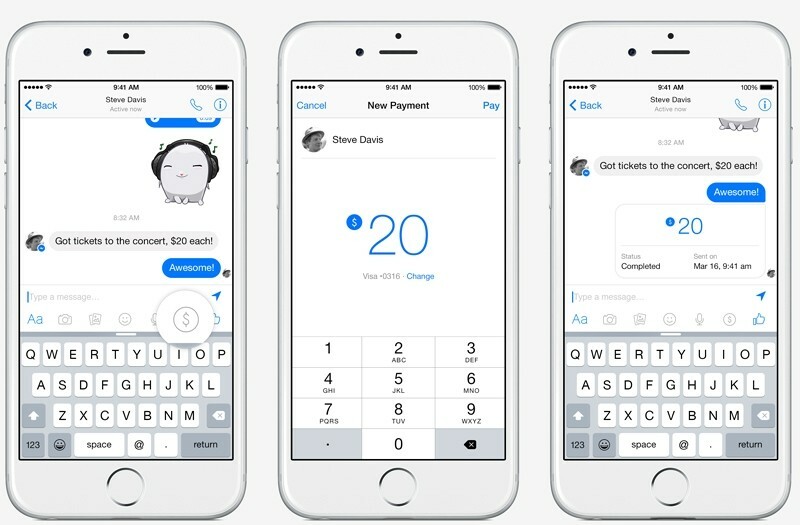 Facebook notes that it handles all of the payments processed on Messenger in-house. Some will no doubt be apprehensive about trusting a social network with their financial data but the company reminds users that it has been dealing with payments for game players and advertisers since 2007. At present, Facebook processes more than a million transactions each day. The new feature will be rolling out in the coming months for Android, desktop and iOS users in the US.